The 2018 lottery has been run and the winners have been notified. Hunting licenses - find license agents, get applications or purchase licenses by phone or the Internet. Learn about Minnesota's elk and plans to manage them on the elk management page. 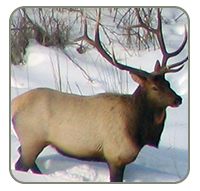 Find information about elk harvest and populations on the Status & Statistics tab of the elk management page.